This is a great fall meal that is easy-peasy to make. Preheat oven to 450 degrees F. Season chicken with olive oil, salt, pepper and thyme. Put chicken and cauliflower on a rimmed baking sheet in a single layer. Use 2 pans if necessary. Roast for 20 minutes. Stir vegetables halfway through roasting time. Add apple wedges after chicken has roasted for 20 minutes and stir. Roast for about 20 more minutes until chicken is golden brown and cooked through, stirring every 10 to 15 minutes. Turn off oven. 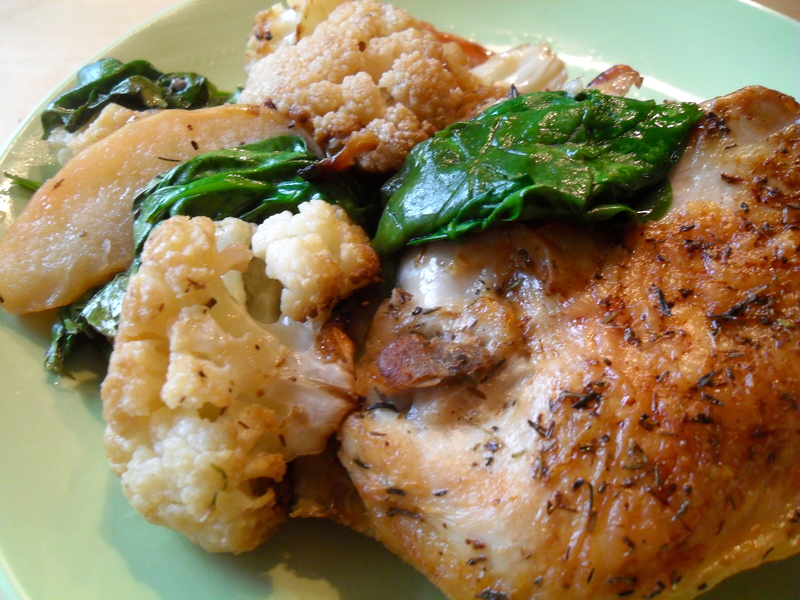 Put spinach on pan, stirring into cauliflower and apples, moving chicken so it is on top of the vegetables. Place pan back into hot, turned off oven for 5 minutes until spinach is wilted. Place chicken on serving plates. Toss veggies and serve along side of chicken.